Mystery Ships Of The Great Lakes: Raise The Flag? What does this picture depict? It appears that a fleet flag is higher than the American flag! The man on the right looks to be raising a pennant with the number 1223. Is this a ship number? The man on the left seems to be to be raising a Union Jack. Does any of the activity correspond with the passing ship? The photo was taken at Belle Isle in the 1960's. The ship is the Shenango II. Thanks to Anonymous for clarifying what is transpiring in the picture. The United States flag is being flown from a flagpole with a gaff. 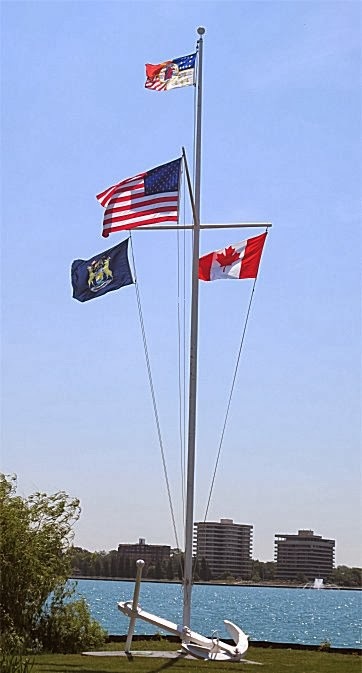 As the gaff is a place of honor in a flagpole configured in this manner the United States flag is always flown from the gaff. Further information can be found here. 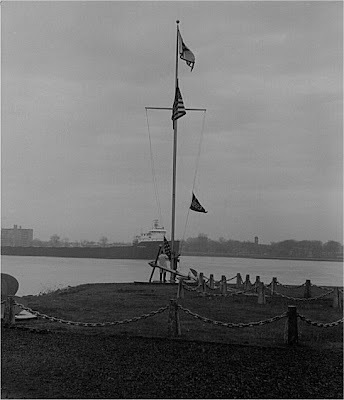 The flagpole is still located on Belle Isle just outside the Dossin Great Lakes Museum. The color picture of the flagpole was taken during the summer of 2013. That's the Dossin Great Lakes museum and the pole/mast is still there. I FEEL THE US FLAG IS ON THE GAFF. CHECK THE MARINE RULES.